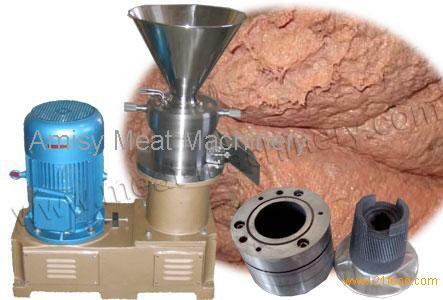 The Bone Paste Grinder Machine is commonly used with Bone Crushing Machine to make bone paste. Bone Paste Grinder Machine is user-friendly, easy to clean and of wide applied range. It can be used to process poultry bone, livestock bone, pig skin, chicken skin and all kinds of fishes, meats, etc. After processed, the original nutrients of the material can be kept well and at the same time the quality of preservation is excellent. All the parts that touch the material are made of the high-quality stainless steel which is in line with the food hygiene requirements thus no pollution to the material. And the grinding head can be adjusted or replaced according to the properties of material and the customer needs. 1. The grinding head is made of first class stainless steel which is processed by the special heat treatment, thus it has high resistance to wear and long service life. 2. Low temperature; healthy and sanitary, no pollution to the material. 3. Fine particle size. After crushing, it can be 5-8mm; after grinding, the final fineness can be 100-200 mesh. 4. It is easy to clean and convenient to maintain. 5. The grinding head can be adjusted according to the customer needs. 1. Bone paste machine can be used with Bone Crushing Machine to process poultry bone, livestock bone, pig skin, chicken skin and all kinds of fishes, meats, etc. 2. It is widely applied to the processing of the sausage, ham, luncheon meat, meat ball, quick-frozen food, savory flavoring, pet food, bone soup, bone powder, health care products and biological pharmacy and so on.